Oh my goodness! Wouldn’t this be the funniest thing ever?? If I ever write fiction I am SO going to do this. 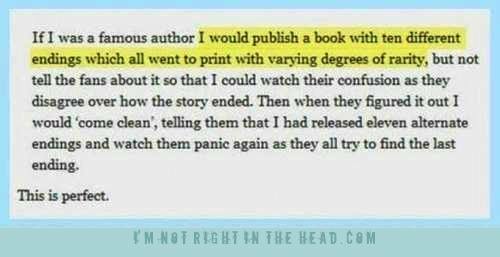 I can think of a few authors in print right now that this would work for already. George R. R. Martin of Game of Thrones, Matthew Reilly of the “Scarecrow” series fame, Clive Cussler, and perhaps even some of the YA dystopian novels that are coming out now would be fun to do this way. Couldn’t you just imagine ? You’ve seen how rabid some of the fans of these YA books are ! “Oh my particular set is better!” “No! My particular genre is better! !” And then , if the ENDINGS were different and they didn’t know?!? HAHAHAHAAAA! Let the madness ensue. To be a fly on the wall at some of THOSE discussions. That would be fun. What do you think? If you could write an alternate ending for any book you’ve read , what book would it be, and what ending would you write?